Free, Competitive Aluminium Bi-Fold Doors Prices! Aluminium bi-fold doors create a stunning, sleek aesthetic which can complement any style of property from traditional to contemporary. Their high performance and versatility make them an excellent choice for homeowners across London, Kent and Surrey. Aluminium is inherently strong and extremely lightweight. These key qualities offer the capability to support a large glazed area with more slender frames compared to other materials. These slim frames provide unrestricted views and allow for more natural sunlight to fill your home. The finished aluminium frames are powder coated to give you one of the most durable finishes on the market. It is this finish that protects your home improvements against rust and peeling, with no need for repainting and no fear of discolouration over time. Aluminium is a lightweight and strong material, creating doors that are secure, highly durable, energy efficient and low maintenance. Not only that but aluminium can be used to create complex set ups, such as moving corners, due to the lightweight quality. Aluminium bi-fol doors have the power to open up any room, flooding your property with natural sunlight and offering stunning unencumbered views. When opened, it feels like bringing the outdoors in. Even when closed you’ll benefit from an increased sense of spaciousness. Today’s modern aluminium frames vastly outperform the previous generations, with the latest technologies. This includes a polyamide bridge inside the frame, producing phenomenal levels of heat retention and saving you money on your heating bills across the year. Our aluminium bi-fold doors are intelligently designed to withstand even the harshest weather conditions. They have all been stringently tested for air permeability, watertightness and wind resistance and have exceeded the required standards. 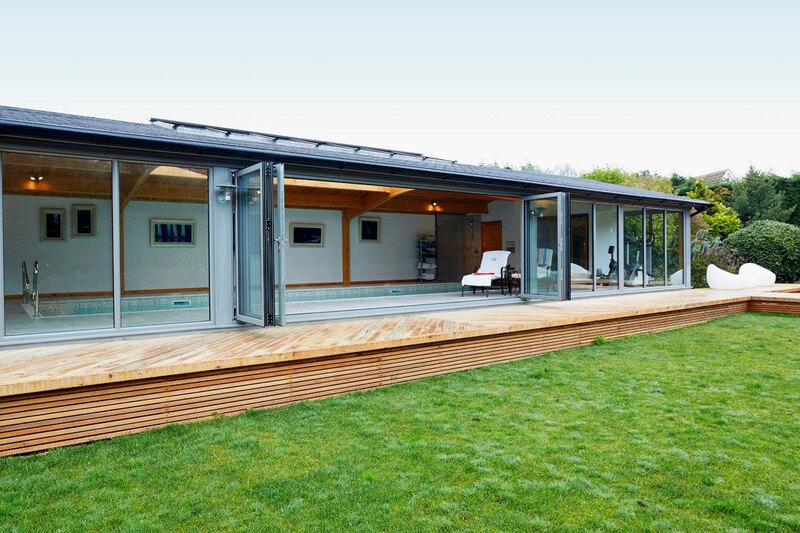 Aluminium bi-fold doors are 100% recyclable, sustainable and reduce the carbon footprint. When recycled, it uses a mere 5% of the energy it takes to make them from scratch. Aluminium is also infinitely recyclable, making our manufacturing process high quality and sustainable. All our of aluminium doors have been designed to exceed the latest security standards to provide you with an enhancement to your home that is robust. With multi-point locking mechanisms and strengthened components enough to deter any potential intruders. You’ll be amazed at the smooth motion in which the doors effortlessly slide. Through intelligent engineering, the sliding doors glide seamlessly within the bottom track to allow for easy use. The concealed carriage ensures efficient and quiet operation without compromising the aesthetic. AluK is a market-leading designer and manufacturer of aluminium doors and windows. 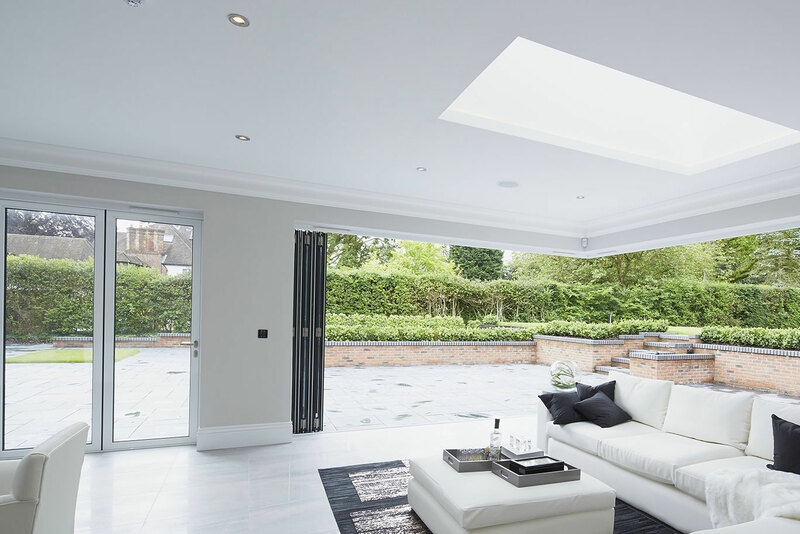 They supply high quality aluminium bi-fold doors throughout the UK and across the world, forever pushing the boundaries of performance through continuous innovation. Our aluminium bi-fold doors are a fantastic solution for any project. Built to incredibly high standards, they produce a sleek and stylish aesthetic, while the clever design along with the qualities of being lightweight and strong, provide an outstanding performance. The ALuK bi-fold door can be upgraded to conform to Secured By Design standards. Thermal polyamides, insulated centre seals and foam insertions are some of the innovative technologies used to create the high thermal efficiency. The design allows for multiple panels to be added with open in or open out options enabling you to accommodate the specifications of your building. The folding doors feature unique flush line pop-out handles to ensure that no more space than necessary is used when opened. Origin’s collection of home improvements are designed and manufactured in the UK to the highest standards, with Origin bi-fold doors being an integral part. Made from premium grade aluminium, Origin bi-folding doors are expertly crafted and beautifully finished. 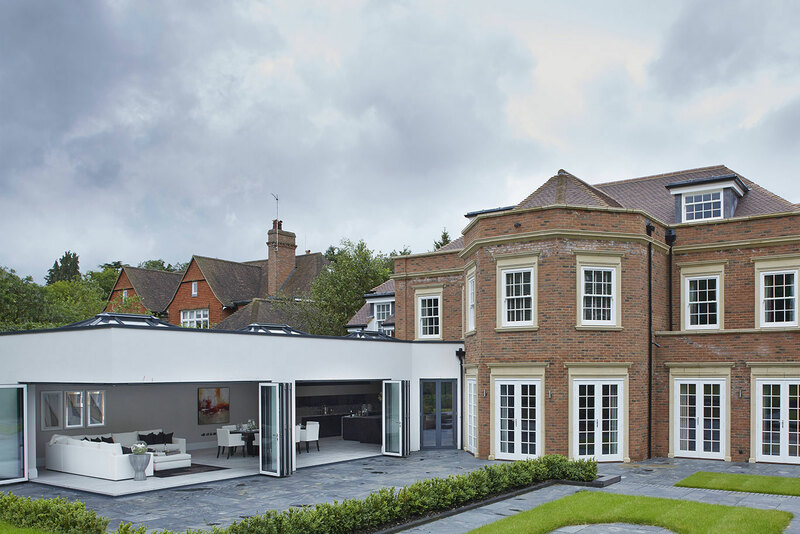 The versatility of these aluminium bi-fold doors can transform any type of property, from contemporary buildings to period homes and extensions. You’ll be able to experience your home in a totally new way. Enjoy longer summer days, warmer winter evenings and stunning panoramic views. Origin take security seriously and have combined a unique 8 point locking system, with enhanced cylinders proven to withstand snapping, picking and drilling to ward off any would-be intruder, keeping your family and home safe and secure. Every product that is manufactured in their state of the art factory is guaranteed to be of consistently exceptional standards. Each door is meticulously tested at every stage of the manufacturing process to ensure you receive a special addition to your home. Smart are market leading suppliers of aluminium doors and windows, with 35 years experience. Their design process is based on looks, security and performance. Their products provide a low-maintenance, high performance and aesthetically beautiful solution for homeowners. Through the use of polyamide thermal break technology, which creates a barrier between the cold air on the outside and the warm air on the inside, this technology significantly improves home heat retention. This increases the thermal performance and energy efficiency of your home. The Smart Visofold series of sliding doors are compatible with commercial and residential situations. They provide stunning opening apertures that bring together internal and external areas to create an impressive space for living and socialising. Smart aluminium bi-folding doors come in a number of different finishes to perfectly suit your style of property. Combining stylish looks with impressive performance, you’ll be sure to find the ideal solution to enhance your home that will last for many years. Our professional installers do everything in their power to minimise any disruption to your daily life and take away the potential stress of installing your home improvements. Our dedicated workforce will complete your installation in no time at all. 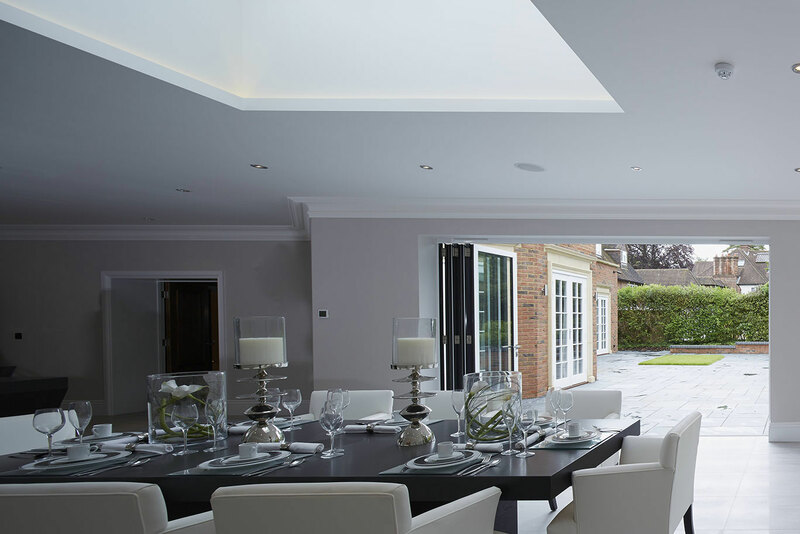 As well as completing your chosen home improvement efficiently and promptly, we ensure that every project is completed with precision and to our usual high standards. Clearing the way for you to start enjoying the benefits as soon as possible and for many years to come. Our professional accredited workforce always work to a high standard of professionalism and conform to current health and safety standards. You’ll be pleased that you chose us for your home improvements when you experience our astonishing service. Our aluminium bi-fold doors come in a wide ranging set of colours, giving you a variety of options to find the perfect match to complement your home. Our incredible finishes include bold, pastel, metallic, dual colour and textured, which are ideal for modern or traditional homes alike. The powder coated finishes are extremely durable, leaving you without worrying about peeling or fading. They will continue to look amazing for years to come as they are protected from rust and deterioration with no need for repainting and hassle-free maintenance. With our extensive range of fully customisable accessories you’ll be sure to find right finishing touches for your doors. Whether you’re looking for a perfect match or a striking contrast, the handles and hinges can be painted in any colour you choose. Every accessory available in our range is manufactured to the same high standards of quality of our profiles and glazing. And if the choice is a little overwhelming, our experienced team members will happily provide you with all details of the hardware options available. Find out how much you could be saving with our online quoting engine. It’s easy to use and you can receive your competitively priced quote instantly. If you have any questions we would love to hear from you. Simply use our online enquiry form and one of our helpful team will answer any queries you may have.